Located 15 miles west of Clayton on US Highway 76, Popcorn Overlook presents a great opportunity to stop and take in the scenery of Northeast Georgia. 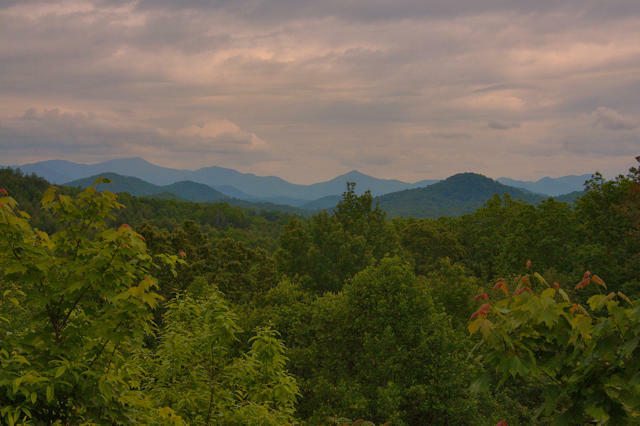 It’s one of the most beautiful spots in the mountains and on a clear day, you can see many peaks in nearby North Carolina. Recently, the movie Lawless did some location shooting here, and there’s a scene in the movie featuring Shia Lebouf that uses this as a backdrop. An interpretive sign placed by the U.S. Forest Services notes: The forests you see beyond this roadside area are a miracle of regrowth. Much of this land was cut over during the logging boom that began in these mountains during the 1880s and continued through the 1920s. Beginning gradually and swelling to meet a growing national demand for wood, large scale logging operations caused extensive damage and forever changed the character of the southern Appalachians. Early mountaineers, accustomed to a hard life and little cash, willingly sold timber, land and mineral rights for small sums. Huge yellow poplars, white and red oaks and black cherry were sold for 40 to 75 cents a tree. Whole mountainsides were cut over and burned, hillsides eroded. Streams that dried to trickles in the fall became raging rivers each spring. Most of this exploitation was financed from outside the region. This destruction generated widespread interest in saving and protecting the mountains. The Weeks Act became law in 1911, and the first land approved for purchase was a tract of 31,000 acres from the Gennett Land and Lumber Company of Atlanta. By 1930, thousands of acres of mountain land had been acquired to protect watershed areas and provide a timber reserve. The Forest Service had begun its long-term and ongoing effort to provide environmental protection and economic stabilization for the Southern Appalachians. Several large tracts acquired from lumber companies were “virgin” forest, remote and inaccessible therefore uncut. However, most lands were cut over or culled, and the best trees removed.